An Oceanic in GTA Vice City. Designed after 1950s-'60s car designs, the front and roof of the Oceanic resemble a 1961 Dodge Dart, 1961 Dodge Polara, or 1962 Dodge Custom 880 ; the sides are reminiscent of a 1955 Oldsmobile 88, and the back resembles that of a 1955 Chevrolet (note that the Glendale also combines 1961 Dodge and 1955 GM vehicles, including the Polara, possibly suggesting that they share a manufacturer or are somehow related). The Oceanic only has a moderate top speed, but it has great handling and torque. However, it is also prone to flipping, especially when attempting to go around corners at top speed. Despite its setbacks, its built quality is excellent and can withstand a lot of damage before blowing up, so it is a pretty good choice for ramming into other cars. This, combined with its 4 person capacity makes it a considerable choice for drive-bys or police evasion. An Oceanic with briefcases in the trunk appears in GTA Vice City in the mission "Bar Brawl". Although it can be driven, the car cannot be saved. 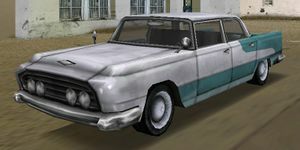 The Oceanic is widely available in GTA Vice City and GTA Vice City Stories. This may be due to the large areas of beach in these two games. In GTA San Andreas, the Oceanic can be seen driven by members of the Los Santos Vagos, and as such, the Oceanic becomes a little harder to find after the player has taken over all of their gang territory. In front of Ocean View Hotel in Ocean Drive, Ocean Beach. The car constantly appears with a yellow-white paintjob. Common in Los Santos Vagos territories like East Beach, Las Colinas and Los Flores. Though, it can still be found after all Vagos turf is taken over (see below). Spawns (after the Los Santos Vagos have been forced out of Los Santos) while driving a Majestic or Perennial in north-east Los Santos (Monday), or while driving a Tahoma in ex-Vagos turf. Spawns in Varrios Los Aztecas territories such as El Corona, Los Santos. Spawns often while driving a Blade, Perennial, Blista Compact, Rancher, or Slamvan. Can spawn in Vigilante and Firefighter. Often seen guarding the target vehicles in Robbery missions. This page was last modified on 6 October 2012, at 20:17.